AcSIR Summer Training 2018 offers an opportunity to work at premier research Laboratories of CSIR with some intellectual and leading scientists in India. The candidates will get an environment which promotes trans-disciplinary research. To apply for the scholarship programme, the candidates need to fill and submit an application form. This page gives the complete details about APJ Abdul Kalam Summer Training Programme 2018. 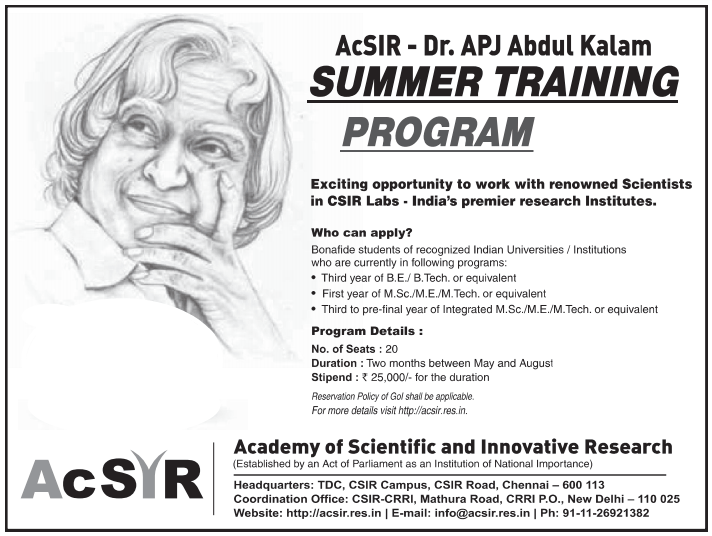 This summer training program is supported/ funded by AcSIR through its AcSIR-Kalam Fellowship. Fellowship Duration: Two months; between the months of May and August. AcSIR Summer internship program is a Residential Program so the selected students will have to have to compulsorily stay on the campus of the respective CSIR Labs on the charge basis. 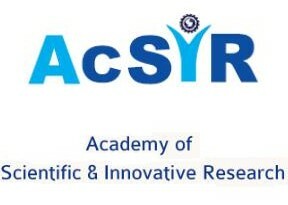 Twenty-five CSIR laboratories are participating in AcSIR Summer Training Program. AcSIR Summer Training Program 2018 is funded by AcSIR-Kalam Fellowship. The selected students for this fellowship will be provided pre-decided fellowship amount & travelling allowance according to the table mentioned below. The fellowship amount will be paid after successful completion of the training program and submission of project report to the Laboratory Coordinator. STEP 1: Registration: Candidate who wants to apply for this fellowship must register first with the academy by providing his/her general detail such as Name, DOB, Address, Gender, Contact Number, etc. After submitting the general details, the candidate will receive a confirmation email including ID & Password. Candidate must click on the link given in the email and fill the application form. Personal Details: Candidate has to fill his/her personal details such as Name, DOB, Address, Gender, Contact Number, etc. Academic Details: Candidate has to fill his/her academic details of PG, UG, Class 10 and 12 level. The candidate can give five preferences of CSIR Labs/Institutes. STEP 3: Upload Photograph & Signature: The recent photograph and scanned signature of candidate have to be uploaded in jpg, jpeg, png formats with the maximum size limit of 50 KB. Candidate can add the other relevant information and also can choose the five Laboratory Preferences. STEP 4: Upload the required documents: The candidate has to upload the required document in PDF format, the documents should not be more than 5 MB. Plagiarism Check Report (for certifying that the Research Proposal is original). And Non-Disclosure Agreement in given formats. The candidate has to submit the AcSIR Summer Training Program 2018 Application Form through online mode only. There is no need to send the application form or any other document to the Academy of Scientific and Innovative Research. However, it is advisable to take a printout of application form for future reference. List of AcSIR Summer Training Program 2018 shortlisted candidates will be announced on 2 February 2018. The selection of the candidate will be based on a Research Proposal and other selection criteria decided by the Committee. The candidates will then be called for the interview round and based on that, the final result will be declared. The shortlisted candidates will be informed electronically. The shortlisted candidates will have to appear in Interview. Interview round will be held at a central location. The candidate has to appear in the interview, it is mandatory for consideration. The candidate may be allowed to appear for the interview through electronic media (Skype etc.) under specific request. Selection of the candidate for fellowship is purely based on merit/ performance in the interview. The arrangements of food and loading will be made for candidate called for interview round only. Applicants with percentage >= 95%, shall fill 10 CGPA. If the CGPA of an applicant is on a scale other than 10, then the CGPA shall be required to be proportionately translated to 10.